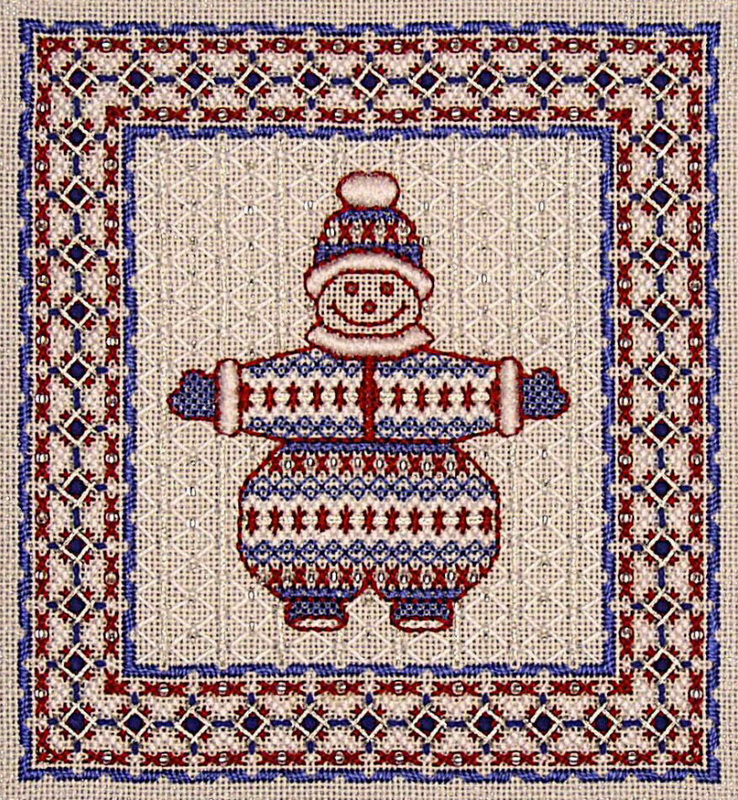 Miss Winter Carnival is a companion piece to two earlier designs of whimsical snowpeople called Mr. and Mrs. Snojangles. The preceding figures are the same size, and the borders used are interchangeable. The new figure is the same width but is slightly taller, so the surrounding border forms a rectangle instead of a square. If arranged as a triptych, the larger design would make an attractive centerpiece, and the blues suggested could easily be changed to a Christmas green to match the holiday theme. COLOR SUBSTITUTIONS. If a holiday effect is desired rather than the wintery look that the blues give the design, substitute a Christmas green (Anchor #228) for the blue specified for two of the cotton threads. #42 Fine Velour is usually a good match, but beware of dye lot surprises. 1 10 yard blister pack #22 blue (5 yards is adequate). This threadshould match the blue pearl cotton - dye lots are not consistent so adjustments must be made.